Authors: Forest Trends' Michael Richards and Steve Panfil with key inputs by Nigel Pitman, Steven Price, Natasha Calderwood and Julie Fischer. Partners: Forest Trends and CCBA, with Rainforest Alliance and Fauna & Flora International (FFI). Sponsors: PROFOR, Morgan Stanley, USAID-TransLinks, GEF-UNDP, Rockfeller Foundation and NORAD provided financial support. Are land-based carbon projects good for local people? Many rural communities are keen to embark on carbon projects as a way of generating income, jobs, and other social benefits. Offset buyers are also attracted to the idea of reducing emissions and simultaneously helping local people. Others are wary that these projects may do more harm than good. However, until recently, there was no clear methodological guidance for carbon project developers to track social and biodiversity impacts. The combination of robust standards for assessing the social performance of projects, and the use of credible methods of social impact assessment could help ensure positive outcomes for local people. A cost-effective and credible impact assessment toolbox would help carbon project developers meet the verification requirements of the Climate, Community & Biodiversity (CCB) Standards and contribute to building more robust, sustainable projects. In response to such issues, Forest Trends has formed an alliance with three other NGOs – the Climate, Community and Biodiversity Alliance (CCBA), Rainforest Alliance, and Fauna & Flora International (FFI) – to produce a user-friendly Manual for project proponents on how to conduct cost-effective and credible social impact assessment. Support for this project comes from PROFOR, Morgan Stanley, NORAD, GEF-UNDP, and USAID-Translinks. The manual is intended for carbon offset project designers and implementers who are not specialists in monitoring and evaluation (M&E). The Manual was field-tested in 2010 in Brazil, Guatemala and Peru. Forest Trends released a first version of its manual in June 2010, proceeded to test it in the field (see case studies listed on this page) and solicited feedback. 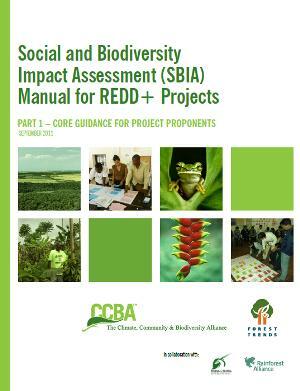 A second version, which integrated biodiversity concerns as well, was released in the fall of 2011 in three parts: a core guidance document and two toolkits (for social and bioversity impact assessments). Guidance to project developers has been provided by regional training workshops held in Peru (June 2010), Tanzania (October 2010), Kenya (August 2011 with GEF-UNDP funding) and DRC (September 2011 with USAID-Translinks funding). This has resulted in training of approximately 80 terrestrial carbon project developers and other REDD+ stakeholders from about 10 countries. These workshops involved hands-on training using ‘real’ REDD+ projects as case studies over a period of 3-4 days. In Tanzania, the Tropical Forest Conservation Group (TFCG) REDD project in Lindi District has undertaken a large scale SIA exercise in 2011 following their participation in the SIA Training workshop in Zanzibar in October 2010. Experience during field testing and further training in social impact assessment shows that the benefits of using the ‘theory of change’ approach to impact assessment go well beyond the generation of a credible social monitoring plan which can meet the CCB or other multiple benefit standards. These wider benefits include: strategic project design necessary for achieving social and biodiversity objectives (clear objectives are essential for identifying monitoring indicators); participation of project stakeholders; promotion of adaptive project management; and the ease of understanding and explaining the results to a range of stakeholders. Keys to better participation of local stakeholders include the quality of the ‘focal issue working group’ facilitators (so the latter need to be more carefully selected and trained); some prior training or exposure for community participants; the use of a ‘practice activity’ to develop good practice consultation skills; and various issues around the more effective participation of local stakeholders, especially women. Based partly on the costs in the three case studies, the authors estimate that the cost of generating a credible social monitoring plan using their approach will be in the range $25,000-35,000 depending on various factors.